Creamy Slow Cooker Smothered Chicken, It's Effortless & SIMPLY DIVINE! There’s not much in life I love more than chicken smothered in a creamy, dreamy sauce. However, the secret ingredient to this Slow Cooker Smothered Chicken recipe is a total game-changer! Slow Cooker Smothered Chicken is quick, easy and tasty. It’s hard to believe that a recipe this simple could deliver such big flavor! Home cooks make this recipe more than once a week, and it’s easy to see why. The chicken turns out SO tender! Slow Cooker Smothered Chicken satisfies the pickiest of eaters too, making it the ultimate family-friendly meal. Making the divine dish in a slow cooker saves you time and hassle — in addition to allowing the savory ingredients to blend PERFECTLY together. So what’s the secret ingredient to Slow Cooker Smothered Chicken? Using HERB CREAM CHEESE for a supremely smooth texture AND out-of-this-world flavor. This mouthwatering meal was seriously sent from the heavens. 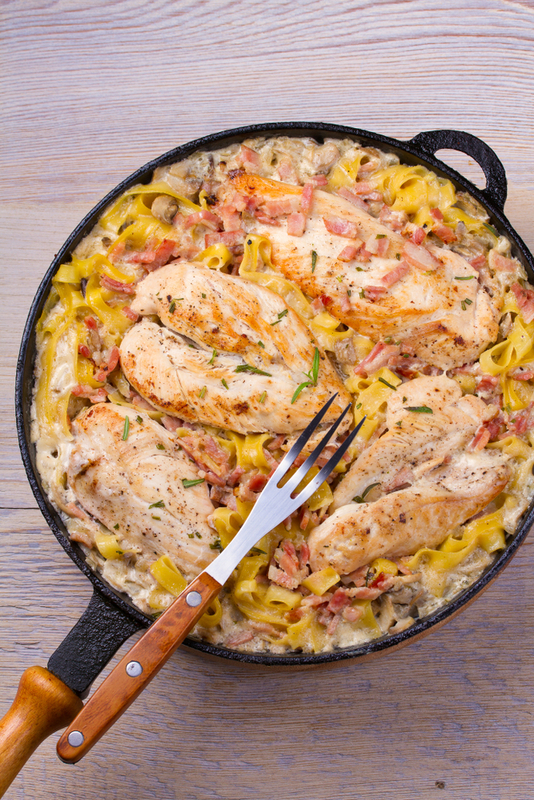 Slow Cooker Smothered Chicken pairs great with egg noodles, pasta or potatoes. If you’re not a fan of peas, feel free to use sliced mushrooms instead. If your taste buds are sensitive to salt, be sure to use reduced sodium chicken broth instead too. Spray bottom of 3- to 4-quart slow cooker with cooking spray. Add chicken thighs to slow cooker. In a small microwavable bowl, mix chicken broth, cream cheese spread, salt, and pepper. Microwave uncovered on High 1 minute; beat with whisk until smooth. Pour mixture on top of chicken thighs. Cover; cook on Low heat setting 3 to 3 1/2 hours or until juice of chicken is clear when thickest part is cut (at least 165°F). Stir 3/4 cup of the bacon and the frozen sweet peas into chicken mixture; mix well. Increase heat setting to High; cover and cook 10 to 15 minutes or until peas are cooked. Serve chicken and sauce over cooked egg noodles; top with remaining 1/4 cup bacon.